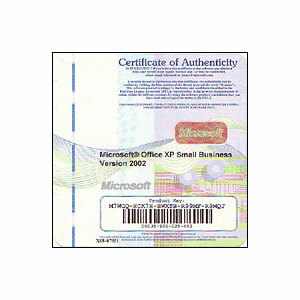 Office XP 2002 Small Business Edition, for Windows 98 or higher; CD & COA. Delivering an exciting new set of experiences that provide a smarter way of working The new XP in Microsoft® Office XP reflects a change in the way Microsoft’s customers should think about interacting with software. XP is short for experience. It symbolizes and introduces customers to an exciting new set of experiences uniquely enabled in Office XP. These experiences enable customers to unlock their creativity and productivity through the power of Microsoft software and the Internet. Office XP also represents an important step in delivering on the Microsoft .NET vision of empowering customers to move beyond disconnected applications, services, and devices to complete computing experiences, thus redefining the relationship between people, software, and the Internet. Office XP is the most significant version of Office ever released. It redefines the relationship between people and software by delivering an exciting new set of experiences that provide a smarter way of working. Office XP delivers the personal experience, simplifying the way individuals work; the collaborative experience, enabling people to easily collaborate on documents and work more effectively with others; and the extended Office experience enabling them to continually integrate additional services into Office and easily access information anytime. Office XP Small Business Edition - includes : Microsoft Word 2002, Microsoft Excel 2002, Microsoft Outlook 2002 and Microsoft Publisher 2002! !